"We believe that the S300 is the most powerful, versatile and user-friendly audio console in its class." The new 32-fader SSL S300 Compact Audio Console. LAS VEGAS – NAB, Central Hall, Booth C3026. 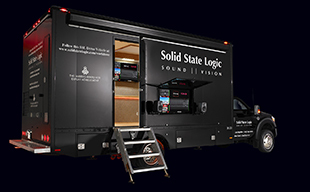 Solid State Logic is extremely pleased to announce the global premiere of the 32-fader version of the System T - S300, compact broadcast console. S300 offers an outstanding combination of performance and value for a wide range of broadcast installations and OB vehicles. The S300 is a fixed layout compact control surface that can be combined with the complete portfolio of SSL’s ground-breaking System T network objects: Consoles, remote tiles, touchscreen interfaces, Tempest Processing Engines, remote PC software and Network I/O. It can be specified as part of a larger System T installation or in stand-alone configurations for smaller broadcast facilities or OB vehicles. S300 presents the extraordinary power and versatility of System T in a streamlined console layout that remains intuitive for operators with a wide range of skill levels.